You are here: Home / Damp / Condensation / Internal vertical DPM’s used in existing buildings to keep out damp; ventilate behind or not? Internal vertical DPM’s used in existing buildings to keep out damp; ventilate behind or not? Using some form of vertical barrier to hide damp has been around for a long time. Many walls in old schools and churches still retain the dado rails and match boarded linings at their base. Recently, dimpled profile membranes, made by Newton, Delta, Oldroyd and Platon have really expanded into this market. The method involves fixing the membrane to the damp wall, usually with proprietary self-sealing fixings. The membranes are profiled, with the wall side looking rather like a well worn football boot, with studs, which hold the bulk of the membrane surface off the wall. The facing side of the membrane may be naked, for subsequent fixing of laths and plasterboard, or have a mesh or ribbed surface suitable for wet plaster or ‘dot n dab application. The plaster system may include insulation, either between the laths or bonded to the rear of the plasterboards. There has been a trend for ventilating the rear of the linings, with a gap at the bottom, top or both. I am writing this article to highlight why this is unnecessary and could even cause problems later. It’s cold outside and we have a solid wall; that’s why it is damp in the first place. Evaporation of water in the wall needs energy. So the wall is even colder – if it could, it would shiver, just like I do when I get out of the shower. In the adjacent lounge, the family are watching telly and the heating is on – toasty. Now then, what with a family of three with a combined lung surface area of two and a half tennis courts, there’s lots of water vapour being exhaled into the room. Remember; all that steam we see enveloping a bus queue in cold weather is just an indication of temperature; we don’t create more water vapour in the winter. Our imaginary family are blowing off a similar cloud, as they vegetate in front of their 50 inch plasma. However, if we touch the wall, behind the sofa, it is slightly cooler; not much, thanks to the insulated plasterboard and our studded membrane. Dig a bit deeper though and we find cooler temperatures. Get through the insulation and touch the membrane and we feel a cold surface. The air behind the plasterboard and insulation is sheltered and moves very slowly. In contact with the cold plastic and plaster, it loses all the energy our central heating put into it. 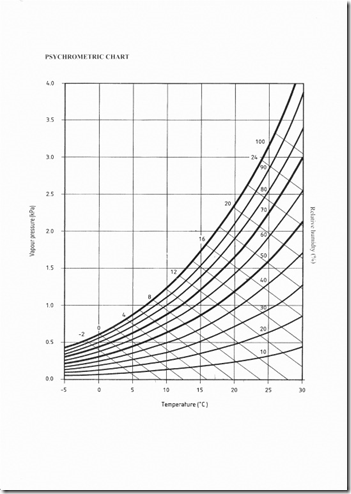 As I outlined in my article A word of Relative Humidity, air temperature is a mover of RH. The H in RH is Relative to the temperature of the air. There is no need to add any more water to get condensation – it is already there! 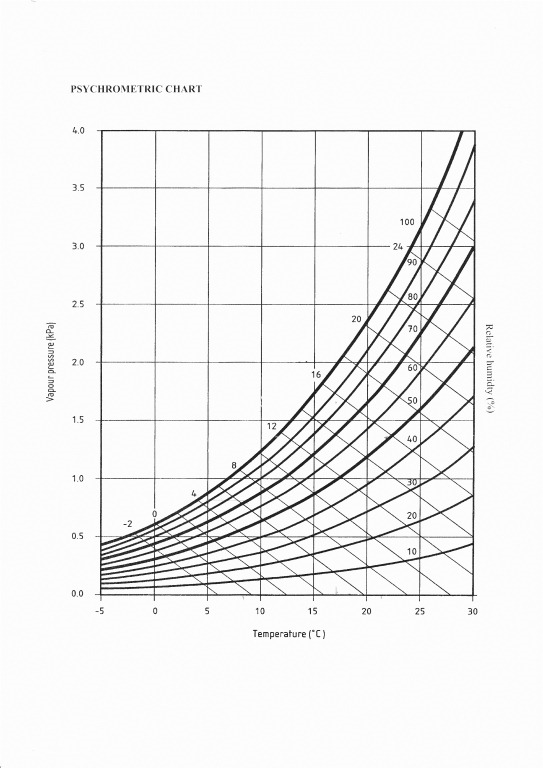 For example, let’s imagine the air in the room, is at 180C and has an RH of say 65%, using the psychrometric chart, we see that cooling of only 60C or so, will be enough to saturate our air as it reaches it’s dew point. Now, as vapour pressure will always run down it’s pressure gradient, the movement of vapour will be from High pressure to Low pressure. The vapour pressure in a property is almost invariably higher within the property than it is outside – or even within the cold outside walls. The humid air will be constantly trying to reach equilibrium, passing through the face of the decorations, plaster and insulation. Providing an easy route for this; via air gaps, will only hasten the situation. In the example above, I would expect to see occasional condensation, happening in the space behind the membrane, and/or on the internal face of the membrane, behind the plasterboard or insulation. As mould spores are everywhere, growth conditions will be ideal. The face of the plaster, may still look great, but after some time, the house may become smelly and if enough condensate is forming, this may even drip onto the floor (if the membrane is not sealed into it or passed below a timber floor). This can cause problems. Bear in mind too, that because the condensate is forming in a small void and in a cold place, there will be no energy to engender evaporation; once it is wet, it will tend to stay wet. Though the parts of the wall which were not already saturated by the initial damp problem, will absorb some condensate by capillary action, eventually adding to the ‘wetness’ of the wall and chilling it further. Condensate forming on the internal face of the membrane will wet the insulation and the plasterboard or dab material. The paper on plasterboard is basically cellulose – moulds love it. The situation will be worsened if the damp problem in the external wall has not been reduced. So the membrane is not a panacea for damp walls, care still needs to be applied, so that the external fabric is as dry as can be reasonably achieved. Research by Safeguard Europe of Horsham, has shown that merely reducing absorption of rainwater can save up to a useful 29% of heat loss, through a solid external wall. This applies to the base of the wall in particular, so if there is rising damp, installation of a DPC, such as DryZone is beneficial, even if a membrane is being applied to the inside face. Membranes are bloody useful, as part of a range of measures, which of course include sensible external ‘housekeeping’ gutters, pointing, render maintenance, managing ground levels and such. If the masonry is just porous and facing into driving wind and rain, consider a good quality breathable water repellent cream, such as Storm Dry. Always check to see if the property has potential issues with high humidity; fancy measurements are not needed, just check for extraction in the kitchen, bathroom and any utilities – do they work well? Reduce the damp problem before application of the membrane. Always hack off the plaster if this is damp and salt contaminated, though sound plaster or render can be left on, any paper on it will be home for mould, so strip it or seal all joints very well. If a humid environment is unavoidable – utility room, kitchen or bathroom, install an internal vapour membrane on the inner, warm face of the insulation. This will help stop vapour passing through to the cold side and condensing. Special thanks to Graham Colman of RTS, The Property Care Association and Safeguard Europe. I read this with interest however what would you recommend in a Victorian property with solid walls where there is no defective pointing guttering all down pipes yet the first-floor bedroom traditionally suffers from excessive condensation. Years ago they used to sell a very thin insulation lining which could be applied on the inside face I believe it was about 4 mm polystyrene and then you could wallpaper over this and it cut down the problems with cold walls. Obviously the occupier should increase ventilation and provide some background heating but it is the latter which is a problem as they often switch off their heating whilst they are out at work. They also don’t like leaving windows open because of security issues thus I have advised introducing some controlled ventilation but this is an expensive option. Thanks for looking in Nigel, I’m glad you found the article interesting. Yes, I remember the polystyrene insulation which a lot of DIY stores sold for this problem. Worked well too, but it has gone the same way as polystyrene ceiling tiles, which were found to release cyanide gas when exposed to fire. There are thin gauge insulation materials like ACTIS, which could do a similar thing – or dry-line and insulate the walls internally (don’t forget the vapour check though). In the recent very cold weather, I have a few clients who are suffering excessive condensation in solid walled houses, simply because of the heat loss through them. It is a particular problem where air flow is a bit static and air has time to dwell against the cold surfaces and chill down to its dew point. Trying to the get the owner on-side, by reducing drying of clothes in the house, using existing fans and such could help; it’s surprising sometimes, how just a small change in habits can bring the humidity down, so that a lower dew point temperature is needed to bring about condensation. Even boiling a kettle in the kitchen is a good enough reason to pop the extractor on for a minute or two. Is there any chance of improving the natural ventilation, without going too far? Maybe trickle vents in the bedroom windows? In cases where the condensation is no more than a nuisance, I never recommend a Positive Input Ventilation unit. I tend to save those for occasions where ‘lifestyle’ changes have been tried and have failed – and the condensation is still bad; causing mould growth. If the walls are naked brick, stone or render (not painted), localised treatment of the exposed wall with a clear, breathable water repellent cream, such as Safeguard’s StormDry could help. Whilst this is designed to stop penetrating damp, a useful by-product is improved heat retention. This is based on reducing heat loss caused by absorbed rainwater during evaporation, We all know a ‘wet wall is a cold wall’ and StormDry has been tested by the University of Portsmouth and the results were quite startling. Safeguard reckon a saving of well over 25% of heat loss is achieved. This will have the effect of keeping the wall a degrees or two warmer and maybe above the dew point. It may be cheaper than the PIV option. Keep me posted, I’ll be glad to help further if I can. Thank you very much for your helpful comments and I went to see this house-I was quite surprised as I had been misled and thought it was solid walls and typical Victorian. In fact it was a modern house probably built around 1980. The front elevation had the usual setback with tile cladding whereas the other walls were traditional cavity walls. The main roof was a concrete tile and there were two ridge vents but I don’t think that they were fully operable and the under felt may have been taken up to conceal them. Insulation throughout the loft area was all over the place and many areas didn’t even have any insulation where the insulation for some reason (probably storage) had been removed and heaped up. In the bathroom there was no ventilation and of course the usual separate shower with no vent. The loft access was in the bathroom and the lid to the loft hatch was loosefitting. The owner of the house commented that he found water vapour dripping along the under felt above the bathroom/shower. Of course there was also a couple of missing tiles and some defective under felt. I explained to them about the problem with extra water lying on plastic storage bags. Bedrooms as were the rest of the Windows were fitted with double glazing with no trickle vents. The owners had recently changed the clothes dryer to a condensing type of dryer and had some slight improvement. When I arrived they had a small dehumidifier which I suspect was useless given the size and I believe it is one of those special “£25 quid” jobs. I was only looking for a friend of a friend and not charging a fee. I suggested therefore that they first of all tackle the ventilation to the loft and make sure that the two tile Ridge vents were operable. Repair the roof and patch up the under felt. Fit a more secure loft hatch lid. Provide some proper ventilation extract to the bathroom through the wall and/or ceiling with a proper duct to the outside. Experiment with the windows which would be expensive to change by at least opening them as there was provision for a first notch type of opening which permitted I guess about 6mm of ventilation along the bottom sections of the top hung large windows. They were concerned about security. There was clear evidence of excessive mould around most of the windows and on the PVC frames. I suggested that they also consider insulating the cavity wall but explained the problems and expense of providing some type of insulated plasterboard to the front wall which was probably only block work with tile hanging and effective vapour barrier I expect. The other issue of course was that they thought they had efficient heating but the old combi the boiler was probably at least 10-12 years old and had not been serviced. There were no TRVs and the majority of the radiators had a circulation problem and could probably do with a power flush out or whatever the correct technical name for getting rid of the sludge. They explained that the heating went off during the day. I went through the living style and explained the problems of excess water vapour and the need to provide at least some reasonable background heating throughout the day and possibly the night during these very cold spells but also to provide some ventilation by considering opening the windows onto the first notch as explained above. They said that they felt that this would leave the rooms quite cold and waste heating and I said that they could at least try this and see whether the situation improved. Of course I had to warn that there needed to sort out the programming of their boiler heating cycle and I said that it would be better to improve the levels of insulation both vertically and horizontally to the ceiling at first-floor level and the walls throughout but in the short term some background heating may be more expensive but would certainly with ventilation go some way to reducing the problems that they were experiencing. I also recommended that they improve their insulation levels in the loft to current modern standards or even greater. Ideally they should have also considered replacement of all the windows but that would have been a step too far. They were very large windows almost full height in some rooms and water was simply running down these. I explained that in the children’s room if they didn’t want to open the window a little onto the first notch then to at least consider putting in perhaps a small vent in the wall. I also recommended that they put in an extract fan in the kitchen because they left the door open and did a lot of cooking. The oven was very close to the main stairwell and hall. These modern houses well not so modern now are a real issue with condensation and of course everybody loves locking up and sealing off and then wonders why they have condensation. Anyway I didn’t have to put anything in writing to them and I wasn’t charging a fee but hopefully I haven’t missed anything. Well, it looks like you’ve covered everything there. I’d say the best thing they could do is get the extraction in the kitchen and bathroom sorted asap and retro-fitted trickle vents can sometimes work; subject to the design of the frames. Let me know how they get on.